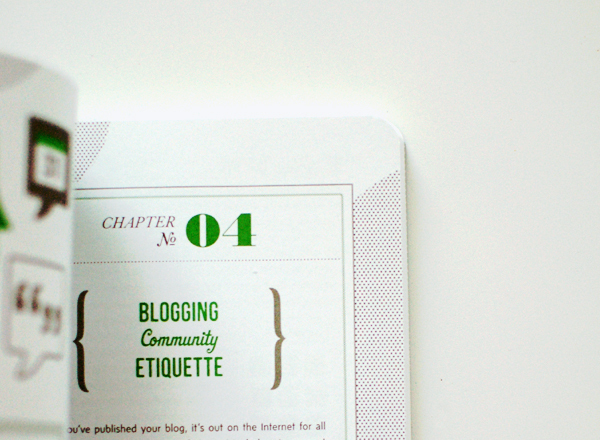 Last month, Chronicle Books sent Joy Cho's new Blog, Inc. my way and I enjoyed reading this thoughtful little handbook to blogging (and will be donating my copy to our local library). The business side of blogs can sometimes be a turn off - advertising, stats, etc. - but beyond those things, this book also covers topics that held my interest in terms of blogging for passion (including interviews with all kinds of talented people who blog). I'm in full support of having more resources like this out there, both for new and experienced bloggers. 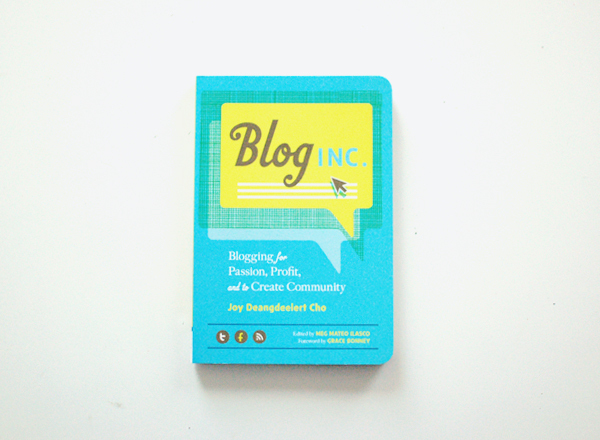 I'd love for you (or someone you know) to have this handy guide, so I'm giving away one copy of Blog, Inc. today! Thanks to Chronicle for offering this - simply leave a comment below to enter (and feel free to add additional entries for any tweets/etc, or for mentioning why you'd like to read this). Entries are open until midnight on Friday, good luck! *Update: Chaucee is the winner & has been contacted (her comment number was chosen using random.org). Thanks to everyone who entered! I recently stopped blogging after a year of steady posts. I'm not sure what direction I want to take my blog in anymore. I think this book could really help me decide what I want to do with my online space! I am just starting a new blog, after taking a break during my daughter's newborn months. I would love to learn from some of the tricks of the trade to help launch my new space. I'm in the same boat as Stephanie, really hoping to read this book and reinvent my blog and gain some consistent readership. Consider me :) I've been play play at blogging for the last few months,would love to step it up a little bit. This looks like a great resource! I'm in the same boat as other ladies here, started out but then got stuck and now I'm looking for the next step. yes! I'll be donating my copy to the Canton Public Library (near Ann Arbor). I'd love to read this!!!!! Would love to check this out! I actually have it in my online shopping cart right now, haha, but have yet to purchase! I would love this book...anything Joy is involved in is a winner! Yes please! I've been wanting to read this, and I feel that I would take too many notes to borrow from the library! Great giveaway! Looks like a good read! love this! i'm sure it will live up! I am curious about this book because I've heard so much about it lately. I'd love to read all the blogger's stories. I want to read Blog, Inc. because I'd love to learn about the logistics behind building a blog. So far I've just been doing my own thing, but some structure might be nice! I've been hoping my local library would acquire a copy but I won't need to wait much longer if I win! I would love to win it. Hello my name is Julia. I realized many ions ago that I wanted to be a journalist or an author of some sort. Then, life happens. This little one would remind me of that... I hope. So here I'm crossing my fingers. I've been trying to find the inspiration to blog consistently and this book seems like a good place to start. I'd love to win it!